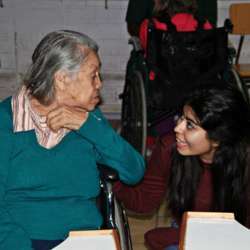 Discover a different world - "Retirement Home Volunteering"
You must be a member of the Santiago de Chile Changemakers Group to attend this activity. Would you like to join this group? This would be our 34th visit to "Cordillera de Los Andes" elderly home ("casa de abuelitos") come and share your joy of living. The idea is share with the community in the "Tea time", so we will prepare them tea that will come together with some sandwiches, juices, yogurt and cookies (without sugar and lactose of course). Also per month we give them (abuelitos) a nice surprise like music, dance, theater, others. This month we are going to have a nice show (surprise). This retirement home is a residence around 86 people that form part of the first three socioeconomic segments that are beneficiaries of the new housing policy in Chile. Most of these seniors are never visited by their families once they are left there sadly vulnerable and never visited. Some have disabilities and some very advaced age, some were abandoned with no place to live and others beaten before the came to this home by their own family members. So our main goal is to cheer them with our visit once a month giving them lots of love and doing special activities with them. Bring your happiness and love. Bring ideas to do new activities. Bring your commitment for this wonderful cause. We will meet at 14:15 hours with our offer food outside Mc Donald corner Santa Rosa with Alameda (next to the Santa Lucía metro station - line 1). Please share your contact information to coordinate on WhatsApp group Protected content .